It proved to be relatively alarming when I booted up Sparkle Snapshots 3D for the first time. 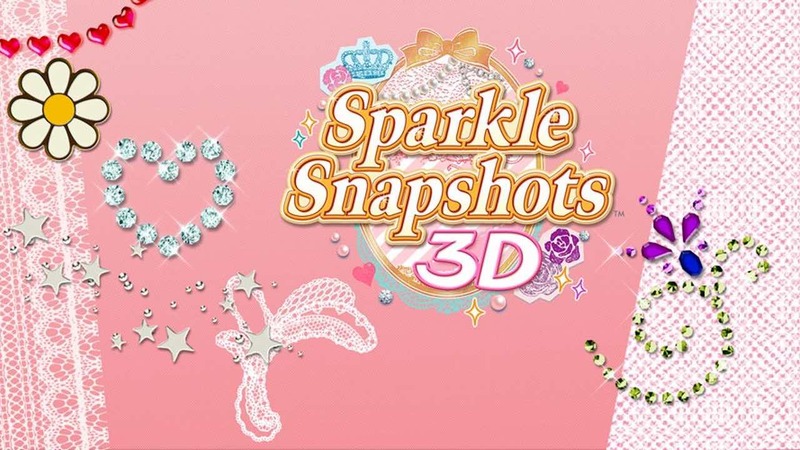 Excessively smiley girls, 3D hearts and frilly lace all scattered across the screen, and a distinct flavour of pink, my immediate recognition was that this wasn’t a game targeted at a demographic that I didn’t fall into. Yet behind such effeminate exterior is an application that serves to diminish the assumption that the Nintendo 3DS is purely a gaming device. Whilst photo manipulation software isn’t an entirely new concept – the original Sparkle Snapshots also having previously released through Nintendo DSiWare – Nintendo have perhaps the first opportunity to pull it in a new direction, ensuring that the glass-free stereoscopic 3D display of the handheld is used in full effect. Players choose from a series of 2D or 3D backgrounds and frames, or a pre-set combination of the two, before snapping themselves or whomever is their subject matter in the centre of it all. Examples include Alice in Wonderland inspired surroundings, sunflower fields, tropical jungles, and even an excellent Super Mario Bros. backdrop. Having made your choice, it’s time to take your snapshot. This can be taken through using either the Inner or Outer camera lens, and a shutter time delay, with a maximum of 99 seconds, ensures that you can countdown for the perfect shot. You’ll have the option of retaking if you aren’t happy, but, if content, you can then move on to making use of editing tools and it is here that the user experience truly begins to shine. An assortment of decorations may be placed in either the foreground or background of your photo, a further array of tools at your disposal that encompass Pens, Stamps, Ribbons, Special and 3D Art. The Enlarger pen, for instance, allows you to select areas of your picture to visibly expand, whereas 3D stamps, provides an opportunity to actively play around with the 3D visuals. Scrawling, doodling or writing across your photo using the extensive amount of varying Pens, categorised across Normal, Clear, Neon, Funky and Artsy types, proves most addictive, later using Stamps and Ribbons to liven everything up. Erasers, not purely for correcting mistakes, also enable you to remove portions of your photo dependent on which layer you have selected, revealing the colourful background that you previously chose earlier. Put simply, there are enough tools here for you to spend hours toying around with the various decorations, adding sparkles to your hearts content. Then, once saved, you can view your photos with your album, and share them with friends within a local vicinity. Alternatively, of course, you can send them through Nintendo Letter Box by adding them as an attachment. If there’s one aspect that ultimately lets the entire experience down, it is more to do with the hardware itself and in evidence of the low pixel resolution the Nintendo 3DS cameras grant failing to do justice to even the most glorious of snaps that you take. Also, if you aren’t of the inclination to adorn your photos with hearts, sparkles and ribbons, then there really isn’t much on offer that will appeal in any shape or form. With a Spark Snap Shop promising even further content, which at the time of writing already includes a Mario Core Set and a Mario Kart 7 set, Sparkle Snapshots 3D certainly looks set to become a well-used addition to the Nintendo 3DS amongst its younger demographic. Let’s just hope that Nintendo can develop a further application aimed toward a far broader market.